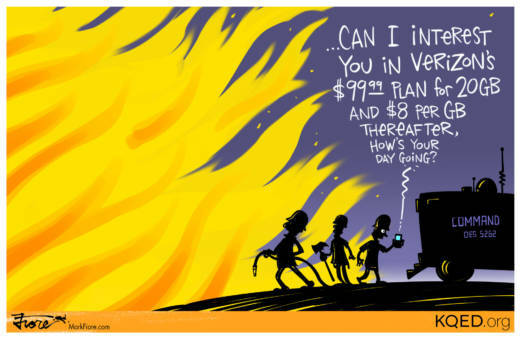 Verizon 'throttled' data speeds for a crucial mobile command center last month, severely limiting firefighters' ability to communicate during the Mendocino Complex fire. According to Santa Clara Fire Capt. Justin Stockman, the internet service provider reduced data speeds to and from the mobile command center so much that their internet connection had "no meaningful functionality." The Santa Clara County Fire Department command vehicle relies on an internet connection to help perform its function as a communications hub for incident commanders. Verizon says throttling internet service to emergency responders was a "mistake."